Comedy has a left-wing bias, which almost certainly gives liberal ideas an easier ride when it comes to satire. Combine that with the wider backlash to what’s seen as the all-pervading influence of excessive political correctness with ‘snowflakes’ demanding ‘safe spaces’ and the like – and maybe the political right does deserve to claim more ground in comedy. ‘We lack the advantages of humour and mockery,’ says Philip Dunn in the introduction to The Absolutely Essential Book of Jokes About the Left. ‘For too long the left have monopolised these instruments, and sarcasm and insults continue to be part of their modus operandi. All very well and good, but this is the most dismally humourless book from an author who may be well-versed in the finer points of obscure political theory, but wouldn’t know a joke if it fell out of a Christmas cracker..
‘Question: What do you normally get if you have a Conservative or former Blairite minister and a left-wing comedian appearing jointly on the BBC topical debate programme Question Time? The book is pervaded with mean spirit – which is fine comic fuel, you’d never accuse the likes of Frankie Boyle of being warm and generous in his jokes – but no concept of how to channel that visceral dislike of the left into a well-crafted punchline. There are scores of ‘lightbulb’ jokes, which a only rarely the source of great hilarity even without any political agenda. A few get repeated, too, which is probably sloppy editing: ’How many socialists does it take to change a light bulb? The answer is Socialism!’ ‘How many Militant Tendency activists does it take to screw in a light bulb? The answer is Socialism.’ That’s part of Dunn’s problem - he thinks ‘socialism’ is punchline enough, he needn’t concern himself about the mechanics or rhythm of a joke. All this is before we get to lines about how many ‘Foucaultists’, ‘neo-Zapatistas’ and ‘Brahmins’ does it take to change a light bulb. You’ll need Google to understand some of the set-ups, let alone the punchlines. Before – ill-advisedly – becoming a self-styled humorist Dunn was museum curator concerned about the growth of ‘neo-Marxist critical theory’ in that world, and it appears to be from this point of view that he’s started, rather than much wit. Alongside the arcane, academic references, he takes aim at comedians he feels are too left-wing such as Al Murray. I think quite a lot of people would be perplexed by that, for sure. He also suggests, in three separate bits, asking Jeremy Hardy, Mark Steel and Frankie Boyle about their favourite canapes would be hilarious too. 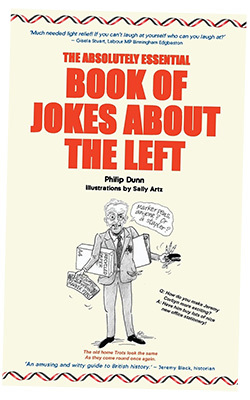 • The Absolutely Essential Book of Jokes About the Left by Philip Dunn, illustrated by Sally Artz, is out now by self-publishing house The Choir Press priced £6.99 on Amazon.